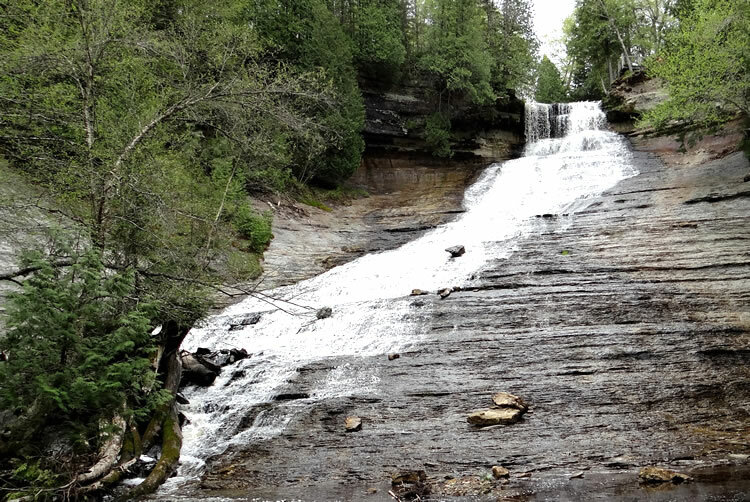 One of the tallest waterfalls in Upper Michigan, Laughing Whitefish Falls is a must-stop when you are in the Marquette or Munising areas. Laughing Whitefish Falls is classified as a slide waterfall and drops a total of 100 feet. 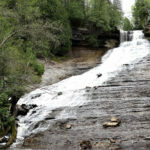 It is located within Laughing Whitefish Falls State Park. The falls are best visited in the spring or after a heavy rainfall. In the summer the water flow diminishes significantly. Laughing Whitefish Falls is located about a 30 minute drive in between Marquette and Munising near Chatham, Michigan. For exact directions please refer to the map below. Once at the parking area, there is a 0.6 mile long hike to reach the falls. There are also bathrooms and a spot for lunch located near the parking area. The hike from the parking area takes you through a beautiful old growth pine and hemlock forest. Once you reach the falls, you can climb down a staircase next to the waterfalls or view them from a nearby observation deck. Since Laughing Whitefish Falls is located within a state park a Recreation Passport is required for entry.